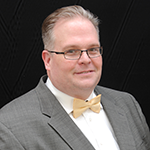 Andrew Markel is the editor for Brake & Front End and has been on the staff at Babcox Media since April 2000. He is a former technician, service writer and service manager with experience at independent shops and dealerships. Andrew is also an ASE certified automotive technician. Andrew has spoken at industry events such as the SAE Brake Colloquium and FMSI Annual Conference. He has also been quoted in publications like Smart Money and Crain’s Business. He is active in motorsports and owns several vintage vehicles. In the 1980s, many racers were experimenting with turbochargers on stock engines. Colossal horsepower and torque numbers could be produced for a short period until the engine self-destructed. One of the weakest links they focused on was how to keep the head attached to the block under extreme pressures. Many engine builders experimented with copper gaskets, deck plates and other solutions to solve head gasket failures. What a lot of the engineers and engine builders could not see was what happened at at peak cylinder pressures. The head and bolts were distorting and allowing combustion gases to get in between the head and block. They couldn’t witness what was happening but they could see the results in the head gaskets. Another cause of hot spots could be clogged oil cooling jets that spray oil through and on the backside of the piston. If the passages become blocked, the heat can’t be transferred to the oil. One Formula One turbocharged engine builder used a single casting for the engine and cylinder head. This engine was a machinist’s and engine builder’s nightmare because the valves and seats had to be installed through the bottom of the cylinder’s bore. It was also very expensive because the head could not be salvaged if the block was damaged. The solution for many engineers and engine builders addressed three main areas to solve the problem. First, the designs of the block, head and fasteners were engineered to take more pressure. Second, the design of the head gasket improved to help seal the head to the block. Third, tuners got better at controlling conditions that produce sudden spikes of pressure. This evolution has also taken place in the OE world over the past decade to control the phenomenon now known as head lift. 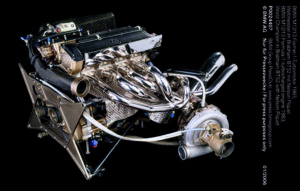 Today, OE and performance engines are at the same apex with regard to engine design and cylinder pressures as some race engines were in the 1980s with turbochargers. 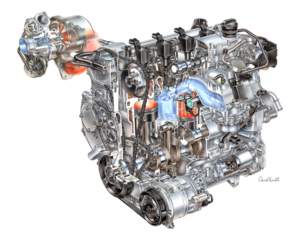 OEMs are seeking more power and fuel economy from smaller displacement engines. New technologies like direct injection, variable valve timing and turbocharging are driving this evolution. But, these technologies are pushing combustion chamber pressures far beyond what they were a decade ago. For performance engines, power adders like forced induction and nitrous oxide are pushing peak cylinder pressures to new levels. More pressure means more stress on the combustion chamber. In some cases, the stress has gotten so high that the pressure distorts the head, gasket and mounting bolts. Head lift is not the whole head simply lifting away from the block, but indicates distortion in specific areas of the head and block interface where the head gasket is installed. This distortion can damage the head gaskets and head bolts. It is not a constant running condition. Head lift occurs in milliseconds during high-stress conditions where the greatest combustion chamber pressures are experienced. As the incidents of head lift add up, the head gasket and fasteners will be fatigued and eventually be damaged. Unless you own an engine foundry and laboratory, there is a limit to the combustion pressures an engine can contain. But, knowing the trends that are influencing head lift can help you spot a head lift problem. Hot spots can be caused by carbon deposits that form on the head, valves and pistons. The source of the carbon could be either oil or fuel. Another cause of hot spots could be clogged oil cooling jets. Late-model engines have increased compression ratios to new levels. During the past decade, compression ratios have risen from a mild 8.5:1 to 9:1 to an average of 11.5:1 to 12:1 for most naturally-aspirated production engines. For turbocharged engines, the compression ratios have risen from an average of 8:1 to an amazing 9.5:1 to 10:1. This is being done with 87-octane gasoline and not premium or race fuel. These high compression ratios are possible because the air, fuel and spark are tightly controlled. Most modern engines dance on a razor’s edge between a lean combustion event and a misfire. This edge is where the engine produces the most power, efficiency and lowest emissions. Also, engineers are trying to get the most power at lower engine speeds to improve efficiency. Some direct-injection engines can run air/fuel ratios as high as 65:1 for limited periods of time. Unfortunately, these air/fuel ratios are where the peak combustion pressures and temperatures are experienced by the engine. The other factor you can’t control is the design of the engine’s head and block. Technicians and engine builders can’t control how the head is cast or the design of the deck of the block. But, there are replacement gaskets, head bolts and other parts that improve the factory design. 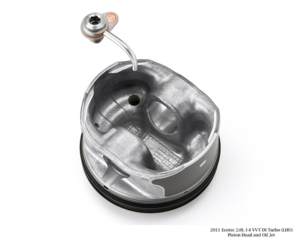 Some performance heads for LS engines are specially designed to hold up to the pressures of supercharging and turbocharging. Head lift occurs in milliseconds during high-stress conditions where the greatest combustion chamber pressures are experienced. As the incidents of head lift add up, the head gasket and fasteners will be fatigued and eventually be damaged. The key to preventing head lift is to control incidents that cause high cylinder pressures and temperatures. Head lift is not a constant condition. It typically occurs when factors fall outside of normal combustion. These conditions include pre-ignition and lean combustion events. Both conditions can cause sudden spikes in combustion chamber pressures. A pre-ignition event can create a second pressure wave inside the cylinder that can dramatically increase overall cylinder pressures. The increased pressure is what makes pre-ignition incidents so damaging for engines when compared to other misfire conditions like detonation. The forces generated by the pressures during the pre-ignition events can cause head lift. On a stock engine, you don’t have any control over the ignition timing. But, the OE might have new software and calibrations for the ignition and fuel system to help control pre-ignition events. For high-performance engines, new spark control boxes and ECU offer tuners a wider range of inputs and sensors to control ignition timing. Hot spots in the combustion chamber can prematurely ignite the air/fuel mixture. When ignited, it creates a second pressure wave inside the cylinder that can dramatically increase overall cylinder pressures. 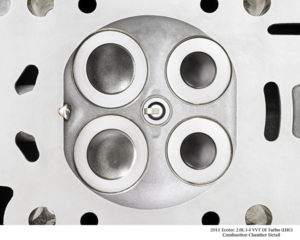 Hot spots can be caused by carbon deposits that form on the head, valves and pistons. The source of the carbon could be either oil or fuel. A pre-ignition event can create a second pressure wave inside the cylinder that can dramatically increase overall cylinder pressures. The increased pressure is what makes pre-ignition incidents so damaging for engines. One item you can control is the oil in the crankcase. Pre-ignition that causes a head lift condition can occur due to engine oil in the cylinders. Tiny oil droplets always exist in the crankcase vapors of any engine. These droplets of oil can find their way into the combustion chamber. This happens on every engine and manufacturers machine the surfaces of the cylinder walls to retain the oil. The droplets are not the issue. The chemistry of the oil and its additive package can cause the pre-ignition event under conditions found in a modern engine. If an oil has a high NOACK index and it uses additives that can increase the chances of combustion of the oil droplets when they are exposed to extreme heat and pressure. Making sure you have high-quality oil suited to the application is critical. This is why GM introduced Dexos 1 Gen 2 oils to cure low-speed pre-ignition (LSPI) problems in their direct injected turbocharged 1.6L and 2.0L engines. If an engine has a head gasket failure, one factor you can control is the installation of the head and gasket. In many cases, just replacing the gasket with little or no preparation to the head or block will result in another failure sooner. The head and block should have no more than .002˝ (.05 mm) out-of-flat in any direction. The maximum amount of out-of-flat should not exceed .001˝ within four inches in any direction in a stock engine, so even less is best for a performance build. But, look at both the service information for the correct specification. Many aftermarket MLS head gaskets can handle up to 60 to 70 microinches roughness average (Ra). Even so, the recommended finish for some aftermarket MLS gaskets may be 30 Ra or less depending on the application and the thickness of the rubber coating on the gasket. Most OE MLS gaskets have a relatively thin outer coating and require mirror-like finishes on the block and head deck surfaces that are usually 20 microinches Ra or less. Check the service information or with the gasket manufacturer to get the specification for the right surface treatment. Care should be taken to make sure the gasket is properly aligned. Many MLS gaskets need to be precision fit around the cylinder bores to maximize clamping loads and sealing. Head gaskets can leak or fail if the head bolts are not tightened in the proper sequence or stages, or to the recommended torque value and/or angle. Reusing TTY bolts that have already stretched once is asking for trouble because using them again increases the risk of the bolt failing when it is stretched beyond its initial design limits. 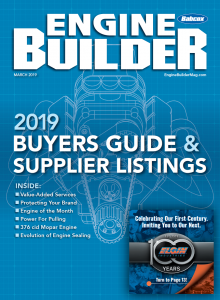 Many production engines left the factory with engine calibrations that allow it to meet specific fuel economy and emissions requirements, but are damaging to the engine under real-world conditions. Often an OE will release software revisions in the form of reflash updates that require a J2534 pass-through reprogrammer. These updates change the conditions that might cause incidents of pre-ignition and high-combustion pressures. It is a good idea to check with the OE service information website to ensure that vehicle has the latest calibrations. If a shop does not do this last procedure, it could lead to a failure of the engine. Andrew Markel is director of content for Engine Builder’s sister publication, Underhood Service.